In ancient times, the area that is now known as Ibaraki Prefecture ( at one time called Hitachi Province) was famous for the production of fabrics . We know this from references in the earliest extant texts associated with this area- the HITACHI NO KUNI NO FU-DOKI (常陸国風土記) – the records of this province`s history and customs- compiled in the 8th century, and the Manyoshu (万葉集）, the earliest compilation of Japanese poems ( also from the 8th century) which contains numerous works which are known to have been written in Japan`s Eastern Provinces. 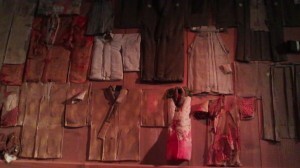 It is also made clear and emphasized in these texts that it was the role of women to create the textiles. Archaeologists have made great advances in recent years in weaving a clearer picture of how early fabrics were created in this part of Japan. 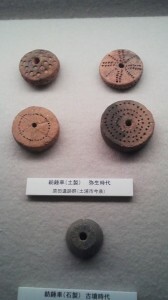 The remains of various tools used for spinning thread and making cloth dating back to the Yayoi Period (300 BC- 300 AD) have in fact been unearthed at various sites in Ibaraki. Still, because of Japan`s extreme summer humidity, frequenty rainfall and wet conditions, in general, archaeologists have found VERY LITTLE in terms of actual samples of ancient cloth. 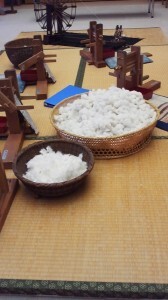 No silk has survived from Japan`s prehistoric period. However, rare traces of hemp cloth, which is thicker than silk, HAVE been found at two 7th century archaeological sites in this prefecture. Interestingly, despite the almost total lack of actual cloth samples, specialist DO know quite a bit about the style of cloth which was typically produced. This is because IMPRESSIONS of woven fabrics are commonly found on the remains of ancient tiles and other ceramic objects. 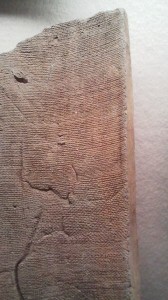 Wrapping clay in cloth at certain points, probably while shaping, was obviously an important part of the ceramic making process. 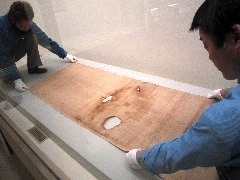 The oldest cloth remnants found in this prefecture ( discovered among the funerary items of 7th century tumuli with some tiny fragments found wrapped around a sword and another around decorative horses gear), as well as some examples of woven-fabric impressions left on ancient tiles, can be seen as part of an exciting exhibition at the Tsuchiura City Museum which highlights a strip of miraculously preserved hemp cloth created approximately 1,200 years ago in a village that is now part of Tsuchiura City. 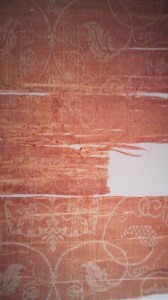 This fabric was used as a CHOFU (調布), a commodity tax which could be paid in cloth or other locally made products. 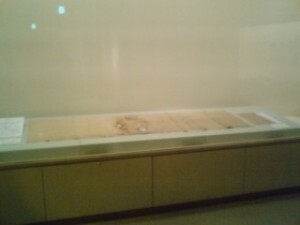 The strip of cloth now on display was first taken to the Provincial Capital in what is now Ishioka City ( then called FUCHU), where it was catalogued and marked by the governor. Then it was sent on to the capital in Nara. Somehow, this piece of cloth ( along with another one created in the same village- at that time called NAKAYAGO) found its way to the HORYUJI Temple where it was preserved ( along with the other piece from NAKAYAGO) to this day. 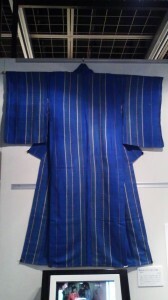 The other piece of CHOFU fabric, (which is actually much more beautiful, as can recognized in a large photo reproduction at the exhibit) was donated to the Imperial Family just after the Meiji Restoration of 1868, and eventually found its way to the National Museum in Tokyo where it is now stored but not displayed. 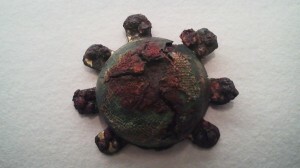 This smaller piece is remarkable for its grape-bunch motifs! The cloth on display in Tsuchiura, known as the NAKAYAGO CHOFU cloth, though lacking any decorative patterns and stained and worn away in the center is still quite impressive to gaze at, and it is interesting to see how MOVED the local people are when they come and have a look. The India ink inscription left on the right hand side by the provincial governor more than a thousand years ago is still amazingly legible. And though I think that just for the chance to see the objects I have described above make a visit to the museum WELL WORTH IT ( especially with the very reasonable 100 Yen entrance fee), the current exhibition offers MUCH MORE. When you have finished examining ( and contemplating ) the venerable cloth artifacts on display on the ground floor, head upstairs where you can learn about how cotton cloth was ( and still is) made in the Tsuchiura Area. In fact, not only can you see videos and other displays detailing the complete cloth-making process ( starting with the planting and harvesting of the cotton) and some excellent examples of locally made wear- but you can also experience much of the process right there at the museum with all the equipment set up right there and plenty friendly guides to help you out. I didnt have much time ( only an hour!) to spare when I visited the museum last week, but I will try to get back there again to try to get a better understanding of the process of cloth making- something which occupied a very large portion of a woman`s time in this area until recent decades. Trying your hand at spinning thread and weaving, and watching the care ( and skill) that goes into the process on the videos which are shown, makes you appreciate how much energy ( and love!) 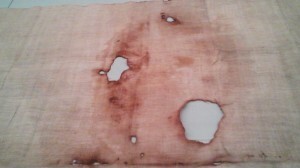 went into the making of even the simplest piece of cloth. With the invention and proliferation of machines which can do all these procedures at 100 times the speed, it is true that textiles have become much more abundant and cheaply available. Still, leaving this exhibition I could not help but feeling that somehow we have lost a very important part of our humanity by living in a society in which we pick our shirts and trousers off the rack at Uniqlo.